It Takes More Than Water To Put Out Fires! The Fire Company and Ambulance are always looking for volunteers. 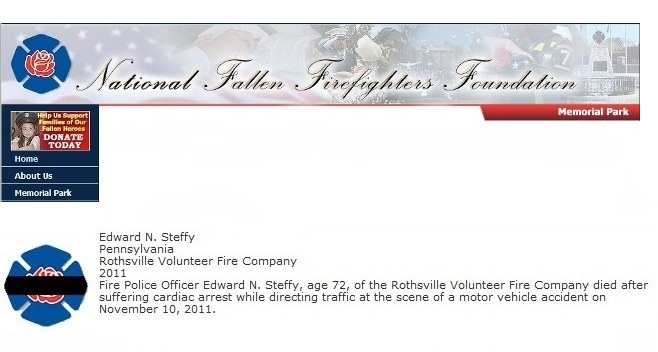 This is the greatest need of all volunteer fire companies and ambulance corps. No amount of money or equipment can replace a person. Opportunities with our station exist for firefighters, drivers, fire police, ambulance drivers, ambulance attendants, and ladies auxilary members. For more information call the station at 626-7805.You can also help by providing financial support. 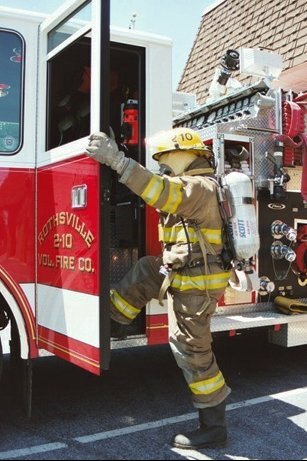 The picture below shows a fully equipped firefighter boarding one of our engines. Our new 2009 Pierce Arrow XT (cost $608,460). The members, all volunteers, raise the monies needed through the annual fund drive, breakfasts, chicken corn soup sale and chicken bar b q. Call 626-7805 for more information on how you can help.